We’d love your help. 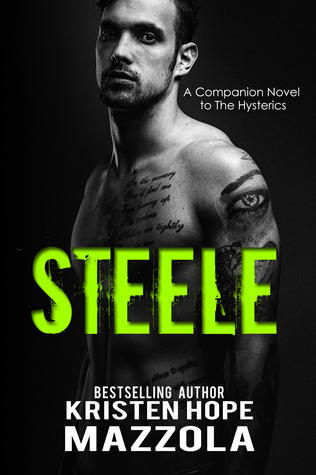 Let us know what’s wrong with this preview of Steele by Kristen Hope Mazzola. To ask other readers questions about Steele, please sign up. This was the first book that I have read by Kristen and I have to say I want to go back and read the Hysterics to learn more about this group! This book focuses on Maverick Steele, he's the bassist for an up and coming band The Hysterics who are quickly becoming a household name. Maverick lost the love of his life years ago and can't seem to get passed losing her. Until he met Cali, who he though would be just a groupie passing. Cali had to make a big decision in order to get her happiness and b This was the first book that I have read by Kristen and I have to say I want to go back and read the Hysterics to learn more about this group! This book focuses on Maverick Steele, he's the bassist for an up and coming band The Hysterics who are quickly becoming a household name. Maverick lost the love of his life years ago and can't seem to get passed losing her. Until he met Cali, who he though would be just a groupie passing. Cali had to make a big decision in order to get her happiness and by the end of the book I couldn't help but love the two characters that Kristen created. I will say if you are looking for a quick beach read this is your jam and the only downside is I wish the author went into a little more background with the characters. So much beautiful emotion packed into this fast read! Rarely do a find a book that’s shorter in length that can really get to me on a level where I cannot hide how I’m feeling. I shed tears, I giggled, and I totally happy sighed all while reading Steele. The magic that is Kristen Hope Mazzola strikes again! I swear her writing is more addictive than carbs. Maverick and Cali’s story is about even more than their beautiful romance, although obviously that’s the star here. There’s such a huge amoun So much beautiful emotion packed into this fast read! Rarely do a find a book that’s shorter in length that can really get to me on a level where I cannot hide how I’m feeling. I shed tears, I giggled, and I totally happy sighed all while reading Steele. The magic that is Kristen Hope Mazzola strikes again! I swear her writing is more addictive than carbs. Maverick Steele! He was the supporting character who most intrigued me in The Hysterics and he did not disappoint. His history in Becoming Hysteric destroyed me. Seriously. I cried and then cried some more. I think you would have to be soulless to not have your heart break for Maverick and Dane. That is why I was SO happy to see him finally move on and start living again in Steele. I think Cali was exactly what he needed and their story gave me all the warm and fuzz Read Becoming Hysteric First!! Steele is a gritty tale of love, lost and revisited. Count on Mazzola to step into the trenches. For Steele, Cali is the one that got away. For Cali, Steele is the man who knowingly and willingly broke her heart. Can they get beyond the drama and lay siege to their second chance? Whether you love him or hate him, Maverick Steele gets a reaction, so grab the Kleenex keep an open up your heart and prepare to tempted by love. It’s an emotionally intense read within these pages, one that pulls at the heartstrings, that brings readers into the second chance romance of Maverick and Cali. With a connection that started in a previous book, but that came to an end because of her fears, readers will be cheering this dynamic duo on as they grow closer together in this romance full of heart and soul. Maverick once had the perfect life with a girl who was his whole world and a baby on the way. That life ended with her death tho It’s an emotionally intense read within these pages, one that pulls at the heartstrings, that brings readers into the second chance romance of Maverick and Cali. With a connection that started in a previous book, but that came to an end because of her fears, readers will be cheering this dynamic duo on as they grow closer together in this romance full of heart and soul. Maverick once had the perfect life with a girl who was his whole world and a baby on the way. That life ended with her death though and it set him on a path of occasional one-night stands paired with guilt. There was one bright spot during that time and it was Cali, a fan who gave him a glimpse of happiness. Despite their instant connection though she walked away. With all his bandmates finding happiness it’s finally time for Mav to find his HEA when Cali once again returns. It’s not smooth sailing to HEA when someone close to him suffers a heart attack and his and his band’s lives are turned upside down. The fragility of life and the power of love guide him while taking readers on an emotional rollercoaster ride that had me rooting for Mav every step of the way. Throughout his journey Maverick endeared himself to me with his enduring love for Leilani making him the quintessential romantic hero. He’s got a big and loving heart, is unwavering in his support for his bandmates, and I longed to see each smile her presence brought to his face. Cali’s a far from perfect heroine and its her imperfections that I liked most about her. Her earlier decision to leave Maverick behind was done in protection of her heart, but by falling back on an easy relationship with a friend, she’s caused even more heartbreak. Her choices were not maliciously made, but were due to her own painful past, and it’s left her feeling admittedly guilty. She never sugarcoated her actions, owned up to them, and her finally putting her heart on the line to be with Mav had me cheering. I liked Cali and I liked the happiness she engendered in Mav in a romance that put me in an emotional blender. Maverick gets his story! I was so excited to read Mav's book. Maverick Steele lost the love of his life in an accident when he was just a teenager. He has yet to find a woman who can make him want to move on until he met Cali.. Cali has been a fan of the Hysterics for some time and they hit it off a few years back but she lived in Florida and felt that life as a country star's girl was just to crazy so she decided to make things work with Mitch. When she realizes maverick holds her heart can she Maverick gets his story! I was so excited to read Mav's book. Maverick Steele lost the love of his life in an accident when he was just a teenager. He has yet to find a woman who can make him want to move on until he met Cali.. Cali has been a fan of the Hysterics for some time and they hit it off a few years back but she lived in Florida and felt that life as a country star's girl was just to crazy so she decided to make things work with Mitch. When she realizes maverick holds her heart can she get him to give her his? It’s been 14 years since Maverick suffered a tragedy which left him in an emotional void and the only woman to penetrate his walls since then has been Cali. Cali is at a crossroads in her life and she must decide on taking a chance on what she could have with Maverick or keeping her life status quo. This is an emotional story of second chances, new beginnings and deciding what really makes you happy. I voluntarily reviewed an Advance Reader Copy of this book. This novella is brimming with deep emotions. At times sweet, at times funny and always poignant, this book gives us Maverick and Cali's story. A very engaging storyline captures and easily keeps your interest. A beautiful story that features pain, loss, heartbreak, second chances, letting go, owning your truth and embracing what you want. A really good read. This is a completely honest, voluntary review. This was a lovely little novella. It was fast, to the point and a perfect treat. Though I would not say that this is a stand alone. I have not read any of the other books in this group and I would have gotten so much more out of it if I had (but this is good and I am going to go read those now!) But yet the author gives just enough of the background that you are not totally lost with everything. I love the family feel of everyone in the band and their 'family'. It was so good to hear from the Hysterics again! I love Maverick and Cali! This novella was an emotional ride I was glad to be on! I laughed and cried while reading this story! Kristen has written another fantastic story for us to enjoy! I can’t wait to see what see gives us next! Kristen did it to me again! I love The Hysterics series Kristen you did it to me again! I couldn't put Steel down till I finished it just like the others! I love that Maverick was finally able to be happy after everything him and his Mountain Breath family has been threw. Don't want to give too much away. Here's to looking forward to more fingers crossed! I enjoyed this short second-chance story. After reading the prequel, I'm so happy Mav got his HEA. Mav and Cali are great together. Maverick and Cali were destined to be together. This was a very emotional book for many reasons. Sometimes to be with your soulmate, others get hurt along the way. Great ending to a fantastic series. I really enjoyed this book. Maverick hasn't been able to move on and Cali makes a life - altering decision without knowing the outcome. The connection between the band members, brothers, and other family was great. I really want to read the rest of this series now. Ahhh!!! Soo cute. Loved Maverick and Cali. With everything that has happened with Mav he totally deserves this HEA. And I’m really happy its with Cali. Even though I didn’t really care for how she handled stuff at home, I’m still glad she came to her senses to be with Mav. Love this series. Maverick and Cali were amazing together! So many emotions in this book. Maverick is still having a hard time moving on after all these years but Cali was just what he needed. This is a fantastic series. I haven't read the rest of the series by I have to say Steele is my favorite so far! It's been 14 years since that faithful night when he lost everything and now its his time! Will Steele get his happily ever after? To find out you need to read this book! I have not read the rest of this series, but this was still a great novella! I cannot wait to read about the rest of The Hysterics! Maverick and Cali were a great couple and all of the supporting characters intrigued me enough to read the whole series now! After reading Becoming Hysteric, I was hooked. I enjoyed reading Maverick's story after reading about his heartbreak. I loved watching him find love. I am looking forward to more from these band members. Maverick and Cali is this books focus. Mavericks has a hard time with loving and Cali trusting since he broke her heart. Emotional and sweet. All are short and would love to have a longer story.